When you do what you can with what you have, you will always make progress. 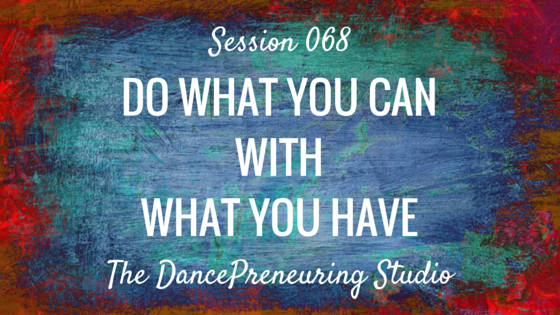 In this session of The DancePreneuring Studio, I share some practical tips on exercise, healthy eating and organizing projects. Step to Success: A step to your success is anything that moves your life and your business forward. Whether it’s an app, a book or an idea, you can apply something today that will help you succeed. Today’s step to success is optimizing your bio on your Instagram profile. Make sure you include your name and website, emoji’s, your other social profile handles, and hashtags. Click here to check out this helpful article. Freestyle Flow: I share an experience of working as a background extra on a set of a t.v. show and how important it is to have eye contact cipro online when you are engaged in conversation. 1. Use food substitutes such as stevia for sweetener. 2. Use parks instead of expensive gym memberships. 3. If you’re waiting in line, use the time to read or take notes. 4. Use stairs or steps for workouts and if you’re really short on time as you’re doing errands, use them instead of elevators or escalators. 5. Use pillows if you don’t have access to a BOSU ball for myotatic crunches as explained in the 4 Hour Body from Tim Ferriss. 6. Use the backside of printed paper as scratch paper. 7. Use Trello, Asana, Google Docs and/or Dropbox to keep projects organized. Question: How have you been creative with your resources?